FEATURED IN: Cortec Introduces New Bio-based Spray Lubricant Featured in Machinery Lubrication Magazine! FEATURED IN: Cortec's 329 D ES in Easy Spray Formula Featured in Food in Canada Magazine! FEATURED IN: Cortec's 329 D ES in Easy Spray Formula Featured in EBom Magazine! PRODUCT RELEASE: Cortec's 329 D ES in Easy Spray Formula: Powerfull, Long-Term Corrosion Protection of Your Assets! FEATURED IN: Environmentally Friendly Spray Lubricant Featured in NED Magazine! FEATURED IN: EcoLine ELP Featured in Food Canada Magazine! FEATURED IN: Cortec® EcoAir Biobased CLP featured in Facility Executive! FEATURED IN: Cortec packages EcoAir Biobased CLP in environmentally friendly spray cans Featured in Fabricator Magazine! FEATURED IN: Lubrication for the Common Man Featured in L&G Magazine! FEATURED IN: Cortec® Packages EcoAir® Biobased CLP in Environmentally Friendly Spray Cans Featured in Structure Magazine! FEATURED IN: Cortec Releases Biobased Ecoline ELP for General-Purpose Lubrication Featured in Concrete Home Magazine! FEATURED IN: Cortec Offers an Environmentally Friendly CLP Product Featured in World Pipelines Magazine! FEATURED IN: Cortec Releases Bio-Based EcoLine ELP Lubricant Featured in IPF Magazine! FEATURED IN: Cortec EcoLine ELP General-purpose Lubrication Featured in Construction Pros Magazine! FEATURED IN: Cortec M-540 Additive Featured in Construction Equipment Magazine! FEATURED IN: EcoLine Extreme Lubricant Penetrant Featured in Vehicle Service Pros Magazine! FEATURED IN: Cortec M-540 Additive Featured in Heavy Construction Magazine! PRODUCT RELEASE: Cortec® Introduces Biobased EcoLine® Fifth Wheel Grease for Semi-Trucks and Trailer Hitches! 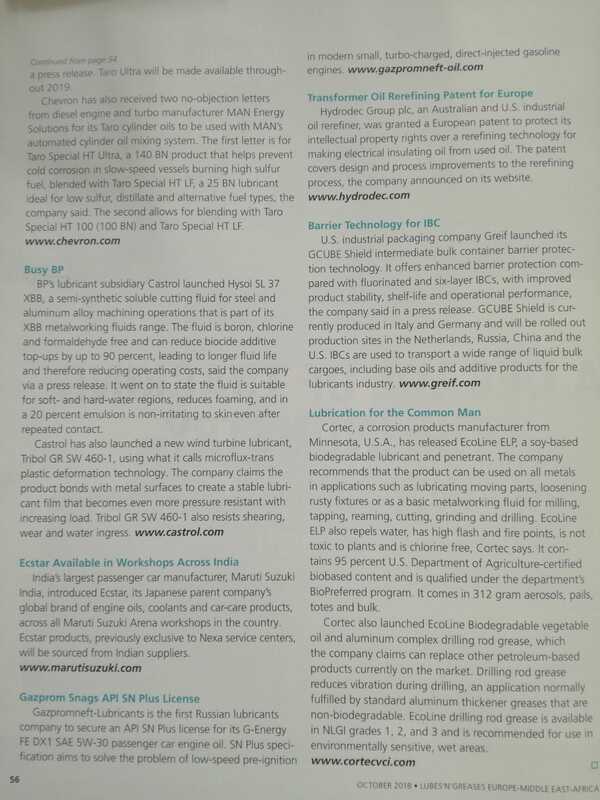 FEATURED IN: Cortec Introduces Biodegradable General Purpose Lubricant Featured in Crown Publications! FEATURED IN: Cortec's EcoLine ELP Provides General-Purpose Lubrication Featured in Fabricator Magazine! FEATURED IN: Cortec Develops Biodegradable Soy-Based Lubricant Featured in Facility Magazine! FEATURED IN: Cortec® Releases Biobased EcoLine® ELP Featured in Indian Textile Journal! FEATURED IN: Cortec® Releases Biobased EcoLine® ELP for General-Purpose Lubrication Featured in BioBased Magazine! FEATURED IN: Cortec Develops Biodegradable Soy-Based Lubricant Featured in PMV Magazine! FEATURED IN: Cortec Launches New Eco-Friendly Lubricant Featured in Arabian Business Magazine! FEATURED IN: Cortec Launches New Eco-Friendly Lubricant Featured in GDN Online Magazine! FEATURED IN: Cortec Releases Bio-Based Ecoline for General-Purpose Lubrication Featured in AZO Materials Magazine! FEATURED IN: Cortec Unveils All-Purpose Lubricant Featured in Machinery Lubrication Magazine! FEATURED IN: Cortec Releases Bio-Based Ecoline for General-Purpose Lubrication Featured in AutoParts Magazine! FEATURED IN: Premium Cortec® M-540 Additive Featured in IPCM Magazine! FEATURED IN: M-540 Additive Featured in Vehicle Service Pros Magazine! FEATURED IN: Premium Cortec® M-540 Additive Featured in Infrastructure Magazine! FEATURED IN: Premium Cortec® M-540 Additive Featured in Construction Technology Magazine! PRODUCT RELEASE: Cortec® Develops Environmentally Conscious Biobased Grease with Superior Corrosion Protection for Machines and Bearings! FEATURED IN: Cortec Introduces New EP Grease Featured in Machinery Lubrication Magazine! FEATURED IN: Cortec Introduces Food-grade Grease Featured in Machinery Lubrication Magazine! FEATURED IN: EcoAir VpCI-337 Fogger Featured in Lubes 'N' Greases Magazine! FEATURED IN: Cortec CorrLube VpCI Lithium Grease Featured in Maintenance Technology Magazine! FEATURED IN: Cortec EcoLine Food Machinery Lubricant Grease Featured in Machinery Lubrication Magazine! FEATURED IN: Cortec Launches Lithium Complex Grease for Corrosion Protection Featured in Corrosion Engineering Magazine! FEATURED IN: CorrLube VpCI Lithium EP Grease Featured in Lubes & Greases Magazine! FEATURED IN: CorrLube VpCI Lithium EP Grease Featured in Vehicle Service Pros! FEATURED IN: Cortec Lithium EP Grease Offers Longer Lubrication Featured in Automotive Magazine! FEATURED IN: Cortec's CorrLube Lithium EP Grease Featured in Construction Pros Magazine! FEATURED IN: Cortec's CorrLube Lithium EP Grease Featured in IPCM Magazine! FEATURED IN: Cortec CorrLube VpCl Lithium EP Grease Featured in Maintenance Technology Magazine! FEATURED IN: Cortec CorrLube VpCl Lithium EP Grease Featured in World Coal Magazine! FEATURED IN: Cortec CorrLube VpCl Lithium EP Grease Featured in Plant Engineering Magazine! FEATURED IN: Cortec CorrLube VpCl Lithium EP Grease Featured in Facility Executive Magazine! FEATURED IN: Cortec CorrLube VpCI Lithium EP Grease Featured in Bearing News! FEATURED IN: Cortec CorrLube VpCI Lithium EP Grease Featured in World Cement Magazine! FEATURED IN: Cortec CorrLube VpCI Lithium EP Grease Featured in Machine Tools World Magazine! FEATURED IN: Cortec CorrLube VpCI Lithium EP Grease Featured in Gear Technology Magazine! FEATURED IN: Longer Lasting Lubricant Offers Corrosion Protection on Electrical Connections Featured in Oil and Gas Magazine! PRESS RELEASE: Cortec® CorrLube™ VpCI® Lithium EP Grease! FEATURED IN: EU Trademark for Rust Preventative Featured in Lube & Greases Magazine! FEATURED IN: Cortec Unveils New Bio-fuel Additive Featured in Machinery Lubrication Magazine! FEATURED IN: Cortec Super Penetrant Featured in IPF Magazine! FEATURED IN: Cortec EcoLine Food Machinery Lubricant Grease Featured in Food and Lubes Magazine! FEATURED IN: EcoLine® Food Machinery Lubricating Grease Featured in Industry Europe Magazine! NEWS ALERT: Cortec's EcoLine® Food Machinery Lubricating Grease Featured In June Issue of Industrial Equipment News! FEATURED IN: Lubricant Brochure Featured in New Equipment Digest Magazine! FEATURED IN: Cortec Lubricants Brochure Featured in Micro Matters Magazine! FEATURED IN: Cortec Lubricants Brochure Featured in Engineering News! PRESS RELEASE: Cortec's New Lubricant Brochure Now Available!